Man I could RAVE about this place. It knocked the socks off any sushi I've ever had state side and was one of the top 5 culinary experiences of my life. The ambiance was a beautiful blend of a classic sushi bar with just a few touches of modernization. The chef was fantastic and spoke excellent english. He was able to describe each course to us in detail. We had about 30 courses of sushi with several excellent Sake's paired by the chef to where we were at in the meal. Highlights for me were probably the dry aged tuna, the salmon roe, and monkfish although every course was excellent. The Shirako (cod fish sperm sac) was one of the strangest things I've ever eaten in my life and it was fantastic! My only slight caveat would be this... if you do not have an adventurous palette this is probably not the place for you. 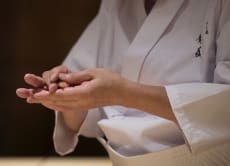 If you're up for a 2 hour sushi and sake experience with some of the best quality and most interesting sushi/fish varieties you've ever tasted 100% go. Also the sushi rice was to DIE for. Everything was great until the 65.000 Yen tab for 2 meals which we were not expecting. great sushi place, big thanks to Voyagin to make the reservation for me. would love to come visit Sushisho Satio again soon! and creativity of his master at Sushi Sho in Yotsuya.